I purchased the C-22 this past February, and we live in a cold winter climate, with a very hot summer climate. After doing a lot of work in preparation of launching the boat this Memorial weekend, there had never been an issue with the fit of the companionway boards. Also, the companionway hatch always slid with ease over the pop-up top. The pop-up top always lifted fine, albeit it's been quite heavy. Saturday evening, I put the boat in the water for the first time since buying it. I opened the pop-up by myself, and I weigh 130 pounds. The next day, while I was lowering the pop-up, it fell hard. Since that time, the pop-up has not set right on its tracks. The aluminum braces don't look bent. However, the companionway boards no longer fit either. The boards are so tight that they won't touch each other. The lower boards have 1/8 space between them. But, the space between the top board and the one below it is half an inch. So, the companionway side have somehow been pushed or expanded toward the opening to enter the cabin, making it, the companionway, a more narrow opening. Also, it seems to be affecting the the pop-up top as it is sitting overhangs on the starboard side because the opening is too small for it now. I am stumped. Furthermore, I noticed the battery storage compartment took on a little water (the big port-side compartment that acts as a companionway step). No water entered the boat from above as we were only at the dock. (There was no wind.) I think there is a leak at the aft end of the centerboard trunk, which would be back in the battery area. The fiberglass was a bit darkened right there. The reason I bring this up with the shrinking companionway issue is because a friend thought that may have caused some swelling in the fiberglass that pushed the inner sides of the companionway closer to each other thus explaining why my boards are now too long for the companionway. Let's look at all the factors where a change occurred: 1) first time in the water in over a year, 2) 101 degrees for two days with high humidity, 3) dropped pop-up top. It doesn't' seem likely to me that dropping the pop-up would cause the companionway opening to shrink unless the slam caused some shifting of the fiberglass. I didn't think that fiberglass expanded or contracted, but it's acting like it's expanded in the heat. In the meantime, we jammed the boards into place as much as we could to attempt to push the companionway side apart again. I doubt this will do much. Has anyone seen this problem before? What did you do? I'm going to suggest the boards fitting too tightly are their own separate issue from either the water or the popup drop. EE's boards took spells of either cupping or expanding during hot humid summer weather. Cupping caused them to not fit in the track slots, and expanding of course meant they wouldn't fit side to side. So option 2 would be my guess. So, you've heard of boards suddenly being too big to fit? What's weird is that it happened overnight. The same time the popup stopped fitting its tracks was the same time the boards became too big. Doesn't seem coincidental. Do you have any pictures you can attach? I have a C22 with a pop-up. 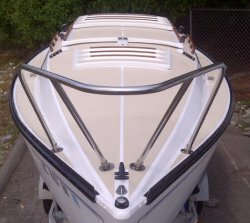 You said everything fit nicely, presumably when the boat was on the trailer, and the keel supported on the trailer. Is the boat still in the water with this condition? If so, now that you're in the water, the keel is only supported by the winch, which is attached to the companionway bridge and it's pulling it down, in effect narrowing the opening. Bob makes a good point if the boat is in the water as he asks ! I never thought about the C22 winch just hanging from the companionway, and if there are teak foot grip strips there you have lots of potential leaks into the sole there. My old boat was creaky there for that reason. I think Bob may be pointing you in the right direction (800# keel pulling down winch/passageway due to delamination/rot.